Great cleaner for playfields with years of grime and wear/tear! Proven highly effective on older playfields with ball swirl marks in the polyurethane finish. Removes a large amount of ground-in dirt, especially from ball swirl marks, making many of them nearly indetectible. Will not erase all of the wear/tear on a used game (nothing will), but does a much better job on age-related dirt and grime than standard cleaners/polishes. Give it a try! Really restores a lot of years to a used playfield. 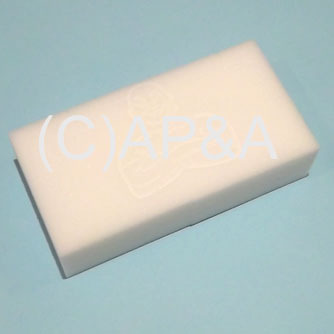 Sponge-like disposable pad measures 4-3/4 inches x 2-1/2 inches x 1-1/16 inches. DIRECTIONS FOR USE: Lightly dampen with water (or alcohol) and use to rub the playfield clean of buildup. Special chemical make-up of the pad penetrates surface grooves where dirt and grime get trapped. Easily and thoroughly breaks up dirt, lifting it away from the surface. Use it over and over until its gone. Tips for Use: One Magic Eraser will usually cover general cleaning of one standard size playfield. For wide-body games, or extensive/full cleaning, we recommend 2 Magic Erasers. We suggest a general cleaning of your playfield surface first, before using the Mr. Clean Magic Eraser. Then follow up the Magic Eraser treatment with Novus #2 cleaner/polish for polishing and adding some shine, and then a coat or two of wax for extra shine and protection.